Vilamoura, an ambitious purpose-built holiday resort on the central Algarve coast, is one of Europe's largest privately developed tourist havens, offering holidaymakers every form of sport, entertainment and amenity imaginable. The resort is built around a magnificent 1,000-berth marina, alongside which are preserved Roman ruins that were unearthed during construction back in the 1960s. 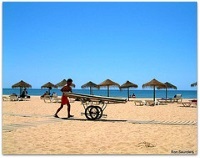 The southern border of the Vilamoura holiday resort is host to a long, sandy beach, which is lined with quality hotels, self-catering apartments, numerous restaurants and shops, and a host of leisure facilities including a casino. Further inland, villas nestle in lush gardens between the golf courses. Vilamoura, which means 'Village of the Moors', is designed for pure pleasure for everyone, of any age or orientation. Nature has enhanced the resort with a temperate sunny climate and beautifully landscaped surroundings. Development has been environmentally friendly and tasteful. Shopping arcades are an integral part of the Vilamoura holiday development, packed with designer boutiques, shoe stores, sport's outlets, perfumeries, tobacconists, jewellers and plenty more. Those wanting to seek out the local colour can make an expedition to the Saturday market in nearby Loule. From fine dining to fast food, Vilamoura has it all in dozens of restaurants, coffee bars, ice-cream parlours and cafés scattered throughout the resort, though many of the most popular places are near the Marina. Nighttime is fun time in Vilamoura, where bars, discos and live entertainment venues abound. Everything from traditional Portuguese Fado to striptease and karaoke is there to be enjoyed. Vilamoura's international Casino is the haunt of celebrities, offering nightly dinner shows in addition to gambling tables, slot machines and bingo rooms. With so many tempting pursuits on offer, it is virtually impossible not to be active while on holiday in Vilamoura. There are five 18-hole championship golf courses (international tournaments are often hosted here), lawn bowling club, tennis centre, riding school, and even clay pigeon shooting. Watersports, of course, abound, and big game fishing is very popular. When all else fails there is always the cinema or casino to fall back on. Sightseeing excursions are also available to nearby Loule with its Moorish castle and 13th-century church. The Roman ruins and museum of Cerro da Vila are popular attractions, located right in the heart of Vilamoura. Some of the prettiest areas in Vilamoura are not open to the general public, including privately-owned areas and exclusive resorts.